First Edition. Printer’s device on title. Latin and Arabic in parallel columns. Edited and translated by Joannes Gagnier. Browned. Recent vellum-backed boards, rubbed. Folio. An important work for the study of 18th-century Orientalism. 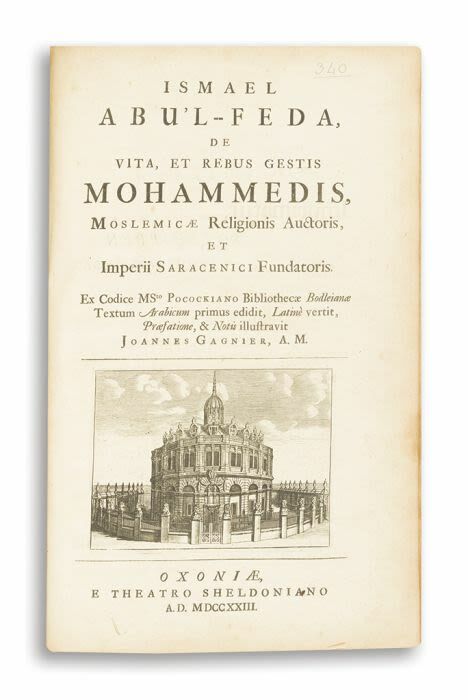 The author of this life of the Prophet Mohammed, Ismael Abu'l-Feda (1273-1331), from whose "Annals" this study is derived, was a Kurdish historian, geographer and local governor of Hama, Syria.